When Shweta of Merry Tummy announced the re-cap event as she is celebrating her blog’s second anniversary, I went through my recipe book as I had noted down quite a few recipes that I wanted to try out from her blog. I had forgotten that I had noted down baked mathri as one of the recipes to try. This event is a blessing as some of the bookmarked ones will finally be tried and tasted. Shweta has some interesting recipes and the photo shoots are amazing. The baked mathri obviously do not taste like the fried ones but I must say for baked ones, they are pretty crispy. I did add a few of my own ingredients as I always add chilli and ginger to the mathri I make. I love mathri or farsi puri as its called in Gujarati. Farsi meaning crispy. The other fact I liked was that Shweta added wheat flour too. Its a recipe that I will be making again and again. I can have mathri without any guilt. Yes, we all know the fried ones are not to kind on the waist. Not only do we add loads of oil or butter in the dough but we also fry them. 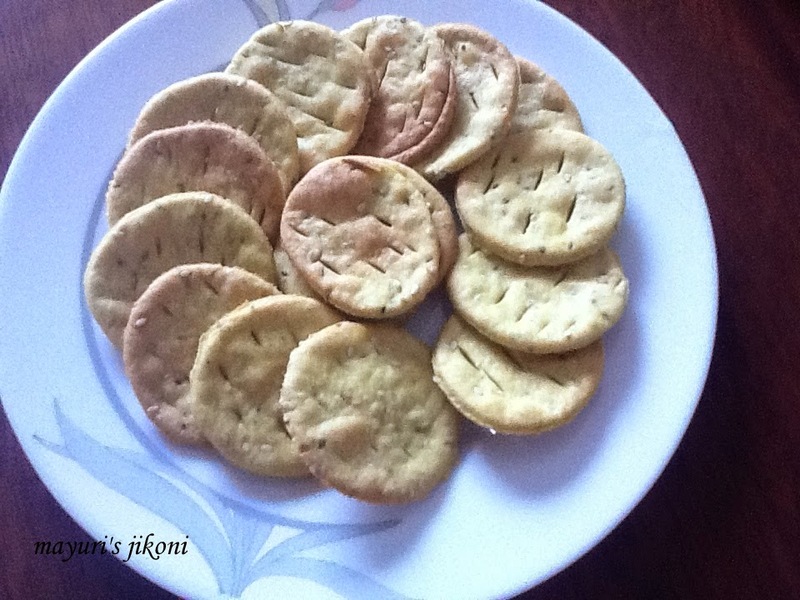 Try out the recipe whichever version you like, I am sure you will not regret it. This recipe is also just the right one for Father’s day as my dad loves his nashtas…. chevdo, gathias, farsi puri, bhusu etc etc. I know he may not like the baked mathri as he feels the original is the best! Sieve the flours, semolina and salt together. Add turmeric powder, ginger, chilli pastes, sesame seeds, ajwain and mix well. Add the hot oil and rub it into the flour. Add water and form a dough that is not too soft or too hard. Cover the dough and let it rest for 30 minutes or so. Roll each part into a circle which is not too thick or thin. More like our normal parathas. I used a knife to make tiny slits all over the rolled circle. You can use a fork to prick the circle all over. Cut into smaller circles using a cookie cutter or pani puri cutter or medium size bottle top. Grease a baking tray lightly. Place the cut mathri in the baking tray. Bake for 12 to 15 minutes or till the mathris begin to brown a little. Cool the mathri on a wire rack. I added a bit more oil to get the crispiness. Make plain ones if you like. Add coarse pepper. Keep an eye on the oven when baking. The mathris tend to brown easily. The amount of water required will depend on the flour. Add little at first as you do not want a sticky dough. Oh my my they look so amazingly crispy and crunchy. Love the idea of using ginger and green chili paste. Just one thing please change the logo. You have to use waffle maker logo. Thanks for your love and recipe for my event. Lovely! Thanks for linking it to Favorite Recipes event! The baked version sounds so healthy. Love to munch a few..